A staple of American laundry rooms for decades, Woolite, a fabric detergent made by Reckitt Benckiser Inc., is one of the gentlest ways to clean fine, washable fabrics. According to the manufacturer, Woolite "has no harsh ingredients. Woolite won't cause shrinking, stretching or fading." The manufacturer goes on to recommend Woolite for "acetate, acrylic, blends, cotton, denim, microfiber, nylon, polyester, rayon, silk, spandex, and wool." Woolite is available in the traditional formula for delicates, plus an everyday formula for all fabrics and one for dark colors. Prepare the garment for washing. Test for colorfastness by wetting an inside corner of the garment and rubbing it with a white cloth. If garment dye transfers to the cloth, wash the item alone to prevent damage to other items. Empty pockets, zip zippers, button buttons and unroll sleeves. Decide if you will hand wash or machine wash. If you're in doubt, wash the garment by hand. Pre-treat spots and stains by diluting Woolite in water and applying the solution to the stain. Allow a few minutes for it to work before proceeding. 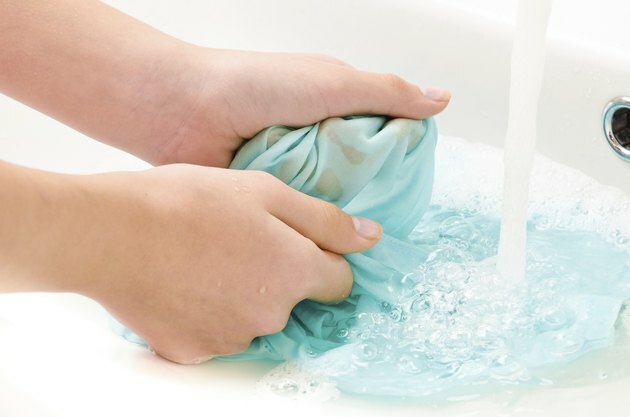 Fill a clean sink with cold water and add a few drops of Woolite if you are hand washing the garment. Swish the water to create suds, then add the garment. Allow it to soak for 15 to 20 minutes. Gently rinse in clean, cold water and squeeze out excess water. Do not wring or twist. Hang the garment or lay it flat on a clean towel to dry. Fill the washing machine with cold water and add Woolite, as recommended on bottle, according to the size of the load. Place the prepared garments in the machine, pushing them into the water until they are submerged. Run the machine's delicate cycle. Remove the clothing before the spin cycle if you're worried about tearing or fraying. You can also enclose each garment in a protective mesh laundry bag before placing it in the machine. Hang the clothing or lay it flat to dry.